In this zoo, we will display not the specimen light curves of various types of EBs (these are readily available elsewhere), but the changes in their behavior. Such changes are what most amateur observing programs aim to find and track. Specifically, here are examples of EBs whose eclipses come early or late for different reasons, and a case where the eclipses no longer happen(!). The most famous eclipsing binary is probably Algol (or beta Persei). It is a star readily visible to the unaided eye (in the sky of the Northen Hemisphere), and about every 3 days it dims visibly for several hours. There is a great deal of available information about it. See Sky and Telescope's page for a prediction of upcoming eclipses. An observer in Calgary, Canada shows photographs centred on Algol at its brightest and faintest. He also points out that eclipses will appear to come early and late due to Earth's movement around the sun (Earth is alternately closer to Algol, and further away from it). When we determine eclipse times, we generally correct them to the time that would have been observed at the centre-of-mass of the solar system, removing this effect. 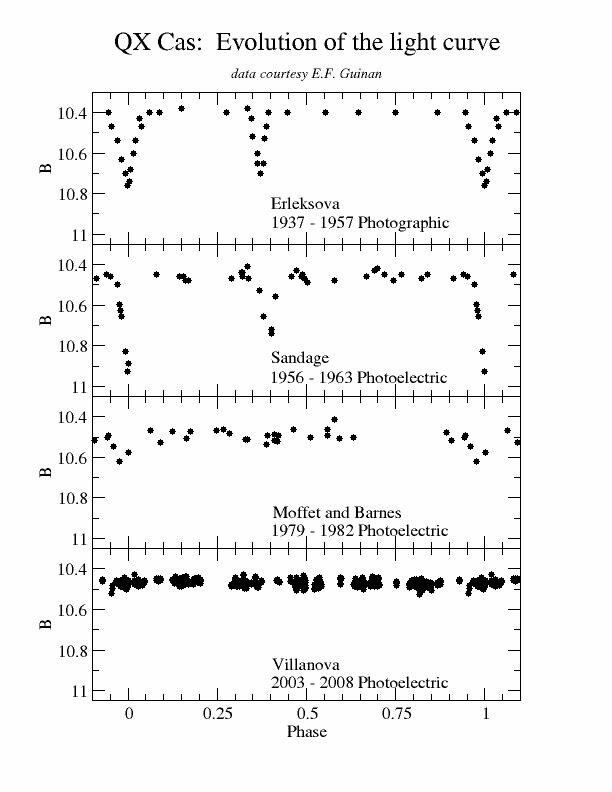 The AAVSO, of course, has a page about Algol which includes a light curve made by a visual observer, and Wikipedia has an information-packed page. There are many binary stars with properties similar to the Algol system, and they are generally known as algols or algol systems. The light curve of algols is nearly flat between eclipses. The deeper eclipse, when the hotter star passes behind the cooler one, is usually called the primary, and the opposite case is the secondary. Sometimes the secondary eclipse is so shallow it can barely be detected. What makes Algol and algols of ongoing interest to observers is their period change behaviour. The above O-C diagram (which is linked from the Mt. Suhora Astronomical Observatory website, at Cracow Pedagogical University, an important site for information about eclipsing binary stars) for Algol shows how much earlier or later (left-hand vertical axis, in days) the eclipse of beta Persei occured, from 1770 to 2005, as compared to the assumption that the eclipses always come at perfectly regular intervals (i.e., with a fixed period). The eclipses arrived about 0.15 days late in 1835 (the peak of the curve), and 0.11 days early (trough) in about 1920, compared to when they would have occurred if the intervals were regular. Such variations in orbital period are associated with mass transfer between the stars in the binary system, and/or eject of mass from the system altogether. The O-C diagram for Y Cygni also shows a lot of "action", in this case it is periodic. This O-C diagram, screen captured from the BRNO O-C Gateway site, shows the timing variations of both primary (filled symbols) and secondary eclipses (open symbols). They deviate from the linear ephemeris by roughly equal and opposite amounts, with a period of 47.6 years. In this case, the orbits of the two stars around their common centre of mass are elliptical (eccentric). The O-C effect is caused by the axes of those ellipses rotating (one revolution every 47 years), causing the primary and secondary eclipses to occur alternately earlier and later. This rotation of the ellipses is called apsidal precession. QX Cas is another algol, but an interesting specimen for our zoo because it shows some special characteristics. Its period is 6.00471 days. Being so close to a whole number of days, this means that if the eclipse occurs at noon today, it occurs 6 minutes and 47 seconds after noon six days from now, 13 minutes and 39 seconds after noon 12 days from now, and so on. The result is, it will be a long time before an eclipse will occur at night. It takes many years to build up a set of observations of the star throughout the whole orbit. Once a full light curve, for the whole orbital cycle, has finally been obtained, one sees that the secondary eclipse does not occur half way between two primary eclipses. In the upper two phased light curves for QX Cas shown here, the secondary eclipse occurs at phase (approximately) 0.38, rather than 0.5 for a system with a non-eccentric orbit. In other words, the two stars do not have circular orbits about the centre of mass of the system, but instead have elliptical, eccentric, orbits. The orientations of those elliptical orbits can then change with time, changing the geometry of the system. Even that is not unusual, and is usually manifested by the relative phase positions of the two eclipses changing (Y Cyg, above), but in this case the result is that eclipses are no longer visible from earth (bottom two graphs)..
QX Cas is one of only a handful of EBs that have stopped showing eclipses to us. The eclipses don't just "turn off", rather, they gradually become shallower -- this is one good reason to archive photometry, not just ToMs. 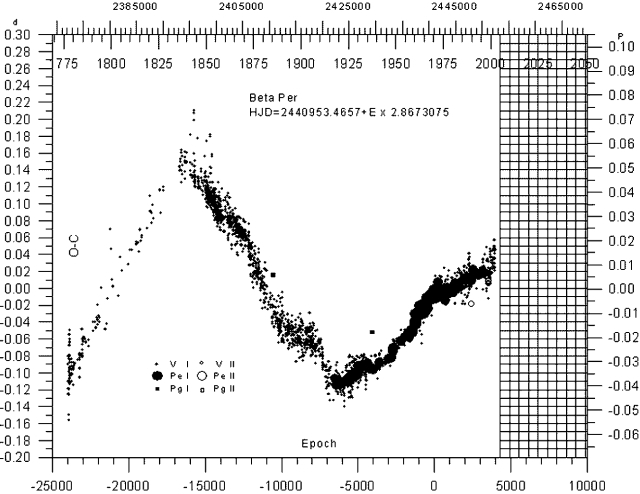 See also IBVS 5090 for similar lightcurves of SV Gem, which has also stopped eclipsing. WW Cyg shows a long-term trend of increasing orbital period (the O-C curve, again from the BRNO O-C Gateway site, is a concave-upwards parabola), but in addition there are "second order" alternating period increases and decreases superposed. The long-term period increase is consistent with the less massive star in the system transferring mass to the more massive star, but the second order effect is more complex. Zavala et al. 2004, propose this is due to a phenomenon called the Applegate Effect, wherein changes in the shape of the primary star, associated with coupling between the changing magnetic field of the star and convection within the star, affect the binary orbit. The theory also predicts there would be a brightness variation associated with this -- another argument for archiving accurate photometry as well as times of minimum. Suffice to say, this star demonstrates that high-accuracy ToM observations, that allow untangling of multiple, sometimes subtle, effects, are useful. Next: a few notes about terminology.